Opportunities are available to teach and conduct research at educational institutions and research centers throughout Sub-Saharan Africa. Beyond their specific research or teaching objectives, Fulbright Scholars to the region build lasting relationships that serve as the foundation for future collaborations through activities such as developing affiliations between institutions in the United States and Africa, or assisting in training and curriculum development. 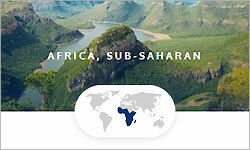 Complete information on past Fulbright recipients in Africa Sub-Saharan can be found in the Scholar Directory.